What: Screening of the Oral History Film, Lorena Weeks - Georgia Woman, Trailblazer for Equity! 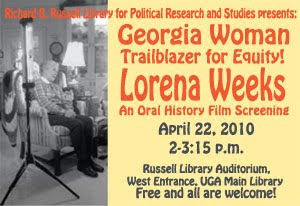 The Russell Library at the University of Georgia is proud to present the premiere screening of Lorena Weeks - Georgia Woman, Trailblazer for Equity! an oral history documenting an amazing woman who played a pioneering role in overturning unfair labor practices towards women in the United States in the 1960s. Dr. Kathleen Clark, Associate Professor of History at UGA, will introduce the film. Ms. Weeks will be a special honored guest at the event. In the 1960s, Weeks courageously challenged the discriminatory practices of her employer, Southern Bell. After a several-year long struggle, Weeks won her case, successfully arguing that Southern Bell’s longstanding practice of excluding women from many higher-paying positions was a violation of Title 7 of the 1964 Civil Rights Act. Her case, Weeks v. Southern Bell, rendered a precedent-setting decision that helped to overturn “protective legislation” and related policies that had long excluded women from desirable and well-paid work. Following the program there will be a light reception and time for questions and discussion. The program is free and open to all. Parking is available nearby in the North Campus Parking Deck on South Jackson Street. Campus and city buses serve the main library location at the South Jackson Street stop. For wheelchair or limited mobility access to the Russell Library, please enter the main entrance for the Main Library and check in at the security desk in the lobby.